Home > Current Buzz > Jonathan Groff Chats About Deathtrap, "Glee," "The Conspirator" and "Twelve Thirty"
Jonathan Groff, the young singing actor who received a Tony nomination for his impassioned performance as the questioning student Melchior in the Tony-winning Spring Awakening, recently completed a six-month run in Matthew Warchus' London production of Deathtrap, Ira Levin's thriller about rival writers in a country house. Prior to his final weekend in the production, which co-starred veteran actors Simon Russell Beale and Estelle Parsons, Groff explained to Playbill.com that his role in the London revival came about while he was "out in L.A. doing 'Glee.' My agent sent me the script with a little cover letter that said, 'It's six months in London. Matthew Warchus is directing, and Simon Russell Beale is starring in it,' and he said, 'Will you fly yourself back to New York to audition for this show next week?' And, I didn't even read the script. Based on London and Simon and Matthew, I said, 'Yes, I'll fly myself back for this audition.' I read the play on the plane and loved it, and then auditioned for it and got it and came over here on July 10th, and I've been here since then, and I leave on Sunday morning!" "One of the most exciting things about doing the play is that [the audience] screams every day," Groff said. "Deathtrap is such an entertainment for the audience. It's so created for them to make them react, whether it's to laugh or scream or jump or sigh. You also have those great moments when …the audience gets ahead of your character on stage, and you get that [reaction of], 'Oh! Mmm! Oooo!' … It's really fun to play because it's just so satisfying to hear the audience making all those different sounds." Although the production was well-received by the critics — The Evening Standard's Henry Hitchings said the play's "brand of unapologetically giddy entertainment makes it sure to be a hit" — Groff feels that a New York transfer is unlikely. "There was [talk of Broadway] when we first opened. There was buzzing about, 'Oh, this might go to New York!,' and producers were coming over to look at it. I mean, who knows? Anything can happen, but I feel like if we were going, we would have found out by now, so I don't think that it's happening. "Maybe it will happen in years to come. I'm sure that it probably will because as we've been playing it over here, you can hear when there are Americans in the audience because they respond to certain American jokes …[since] it takes place in Westport [Connecticut]. So, some days we'll come offstage and Simon will say, 'Oh, there's Americans in the audience today. We could tell.' And it's so clear that the American audiences would, I think, just totally eat it up. But some day I'm sure it'll come back around. It's just such a fun play." When asked how life as a London theatre actor differed from being part of the Broadway community, the Theatre World Award winner answered, "I would say the biggest difference for me is that there's just less bells and whistles over here than there is in New York. The meet-and-greet on the first day of rehearsal isn't as much of a production as it is when you do a play or a musical on Broadway; there's less press. The audiences don't stand up as often as they do in New York. It's a little more subdued... I think, partially, this has to do with the fact that theatres in the West End are spread out, whereas in New York, generally, all the Broadway theatres are within a 12-block radius of each other, so there's less of a feeling of community in the British theatre. There's certainly a British theatre community, but you feel it just a little bit less than you do back home in New York. But as far as rehearsing the play and performing the play and doing the work, it's exactly the same." Groff's West End debut did allow the actor the chance to explore the city of London. "It's been a really amazing time over here," he said. "I just spent four hours today at the British Museum. I'm trying to pack in all of my extracurricular things that I need to tick off my list. I spent a lot of time in the British Museum today, which was incredible, and I saw Buckingham Palace and Westminster Abbey, and I went to Stonehenge on Monday and spent the day with some of my friends from the show in the countryside this weekend. I did a little double-decker bus tour with my parents when they were here for opening and went to the National Gallery. I saw five plays at the National [Theatre] and saw a bunch of theatre while I was here, so it's been a really great time... I was so lucky to have [former Hair co-star] Patina [Miller], who was doing Sister Act, over here. Her show closed the end of October, and then she stayed on for another month and a half. So she was here pretty much the whole time I was here. We had such a good time. We spent every day off together, and it was so nice to have her here." Explaining what he was looking forward to back home in New York, Groff said with a laugh, "You know, they put a lot of mayonnaise in their sandwiches and in their salads over here, and so I'm excited to go to a deli and not have a sandwich that's got fish and/or mayonnaise in it. I'm sure they probably have great Mexican over here somewhere, but I just haven't found it yet, so I'm excited to go to Arriba Arriba. I'm excited to go to all of my favorite places in New York to eat and hang out that I've been missing, but most of all, I'm excited to see my friends. That's what I'm most excited to get back to." Groff, with Portia Reiners, in "Twelve Thirty"
Groff was also excited about his role in the new film "Twelve Thirty," which opened at the Angelika Film Center in New York Jan. 14 following a premiere sponsored by the Film Society of Lincoln Center. The dark dramedy, which was filmed a year-and-a-half ago, features direction by its screenwriter, Jeff Lipsky. When he first read the script, Groff "thought it was really interesting, and I'd been getting a lot of scripts for movies that were predictable, and the characters were one-dimensional, and this script came along for 'Twelve Thirty,' and I was just so fascinated by it because it was unlike anything else I'd read. Every character in the movie was really complex. I was excited to have a real, complex acting experience in front of a camera, which I hadn't really had much of before. I had not done 'Glee' at that point. I had done … one movie before that at that point, which was 'Taking Woodstock,' and so I was eager to do something complicated and interesting in front of the camera…Jeff ...is such a fan of actors and loves actors and loves acting and loves film. He's just a passionate, lovely guy, and so we had a blast in Iowa for those three weeks." Groff, who was also an exuberant and extremely moving Claude in the Public Theater's outdoor staging of Hair, said he was able to relate to "Twelve Thirty" character Jeff because "[Jeff is] an architect, and he's very, very passionate about his work. He's very, very smart and really invested in his career and in his architecture and who his heroes are and what he wants to do. He's very ambitious, and I think what I could relate to is, when I was in high school, I knew exactly what I wanted to do, and I knew exactly that I wanted to be in theatre, and I was very passionate about it, and I read books about it, and I had every experience that I could have possibly wanted. I don't think I was socially awkward, and I don't think that Jeff is socially awkward, but socially, I wasn't as ahead of the game as I was career-wise. In the theatre, I knew exactly what I wanted to do with my life... but personally, I was a little more behind the game, and so I think I could relate to that within the character of Jeff. I could relate to his passion … because Jeff will go off on a tear about what he's excited about and not be aware, personally, of his personal relationships. So, I think I could relate to his ambition and his passion for his career." The actor will also be seen in the forthcoming Robert Redford motion picture "The Conspirator," which is due for release in the spring. Groff plays the role of Louis Weichman in a cast that also boasts James McAvoy, Robin Wright, Alexis Bledel, Badge Dale, Danny Huston, Toby Kebbell, Kevin Kline, Justin Long, Colm Meaney, Stephen Root, Tom Wilkinson and Evan Rachel Wood. The thriller, which explores the national reaction to Lincoln's assassination, features direction by Academy Award winner Redford and a screenplay by James Solomon. "The movie's about all of the people that were involved in the assassination of President Lincoln," Groff explained. "It's the story of Mary Surratt, who ran the home where all of these people were hanging out, and it's the story of her trial. And my character, Louis Weichman, who is a real person — it's just one-and-a-half scenes in the movie, but in my big scene, I get put on the witness stand. … I loved the scene that I got to do. It was so much fun. James McAvoy is her lawyer, and he's one of my favorite actors working today. 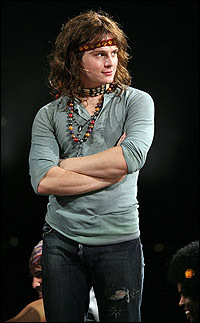 I actually saw him in the West End two years ago, doing Three Days of Rain, and he was so amazing in that. I'd seen him in movies before that, but seeing him in that play, I was like, 'Whoa, this guy is phenomenal.' And so, I was so excited to get to work with him … And he's asking me questions, and I'm on the witness stand, and I'm this seemingly sort of innocent [young man], studying to be a pastor — I had no idea what was going on when they were conspiring to [assassinate Lincoln], and then [I] get slightly caught into a lie, and then you think that maybe I knew what was going on, but then my lawyer comes in and saves the day...I had such a good time working on that movie because I got to go down to Savannah, Georgia, for a couple of days, and act with James McAvoy and get to meet Robert Redford, who directed it." About working with Academy Award winner Redford, Groff said, "I only worked with him for a day and a half, … but the sense that I got from him from that day and a half was that he was just really laid-back and really easygoing and really actor-friendly. He just let me do what I had prepared. He sort of lets you do what you do, I think. He's really, really nice, really easy-going and really a laid-back, kind, gentle, no-ego kind of guy." 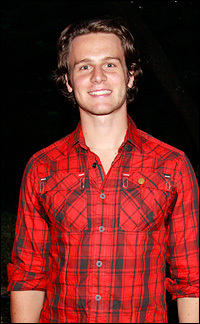 Groff, whose performances indicate that he is equally at home on stage and screen, compares the two mediums as "long-distance [vs.] short-distance running. When you're doing a piece of theatre, you know you're going to be doing it eight times a week, and it's going to be stretched out over a period of time, so you're going to have to know when to conserve. You know when to give, you know when to pull back, and in film and television, you have one day, essentially, to do a scene, and then you're never going to do that scene for the rest of your life. So it's like a sprint, in that you put a lot of high energy and focus into this scene on this one day, and you just create it on the day and then it completely disappears and it just goes by really fast. I think that there's certainly a difference, as well, in that when you're doing a piece of theatre, you're hopefully reaching the back row of the audience, and on camera, the camera's right there in your face, so you're showing a little bit less. You're showing just as much, but I think you're showing it in a different way. "When I worked with Ang Lee on 'Taking Woodstock,' I had a great education, where we were rehearsing the movie and he would just sit with the scene that I was doing. He would coach me one-on-one, and he would say, 'Okay, do it again, do it again. All right, show me less. If you're feeling it, I'll be able to see it. You don't have to show me what you're doing.' I would do [the scene] for him, and he'd be like, 'Oh, there, see! You were feeling it there, you weren't showing it to me. That's right, that's right, that's right.' And so I got an education from him that was really helpful, about having the confidence to know that if you're feeling it, they're seeing it." 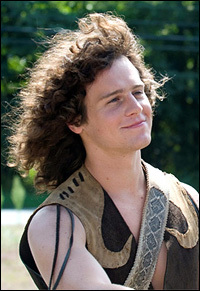 And, would Groff like to return to the Fox hit "Glee," which reunited him with his Spring Awakening co-star Lea Michele? "Yeah, of course. I'd love to," he said. "I had a blast on the show. I'd love to go back and do another episode." The rehearsal schedule for the music-filled series, he said, is "pretty intense. A normal television show is really intense because it moves so fast and you have no rehearsal and you just sort of show up and do the scenes, and it's like a machine. ... And then on 'Glee,' you add on to that going to the studio and recording your number, and if it's a dance number, going to the rehearsal space and choreographing it, as well. So it's just sort of throwing two more elements into that already packed schedule. I had an easier time because I was a guest star, so I got to breeze in and do a couple of numbers and breeze back out again, but for the members of the company that are there every day in the classroom, like Matthew [Morrison] and all of the kids, it's a real grind for them, because even if that particular episode isn't about them, and they're not necessarily singing a lot in that episode, they're still doing all those classroom scenes, and probably recording and choreographing whatever they're doing for the next show. So, they're kept very, very busy, and the schedule is very, very tight." As for upcoming projects, Groff admitted, "I have no projects at all on the horizon, nothing even potential. I'm just going back completely open to whatever happens. I'm really just interested in finding something great to do and finding something that challenges me, whether it's a play or a musical or it's a film or a television show, whatever creatively excites me is what I'm up for next. I'd love to do some more film because I'm totally fascinated by that medium, and it's definitely something I haven't done a lot of, and so I'd love to learn more about how that works and get more and more comfortable in front of the camera. So I'd love to do more film, but I just had a blast for these last six months on the West End, doing this play with this company over here. I feel like you do eight shows a week and you just become a better actor because of it. If you're open and listening on stage every day, it's just such amazing training to do eight shows a week. "I honestly just love acting, and I love all of it, so I'm just up for the next piece that I feel is challenging."